Homemade Ice Cream Sandwiches? Yes, please! I like ice cream sandwiches any time of the year, or day for that matter; and by using bought ice-cream and biscuits means these pretty treats are a breeze to make. The only thing easier than making them is eating them. This recipe uses one of my favourite flavour combinations – raspberries, macadamia nuts and white chocolate… but why limit yourself to this?! Make your own flavor combinations – try soft chocolate biscuits with mint ice cream or shortbread with caramel ice cream with crushed violet crumble… The options are ENDLESS! Add McCain Season’s Choice Strawberries and McCain Season’s Choice Raspberries to a large mixing bowl and using the back of a fork mash them into a chunky paste. Add softened ice cream to berry mix and fold through, allowing the berries to swirl in the ice cream. Cover the mixing bowl with cling-wrap and return to freezer for four hours or until set. 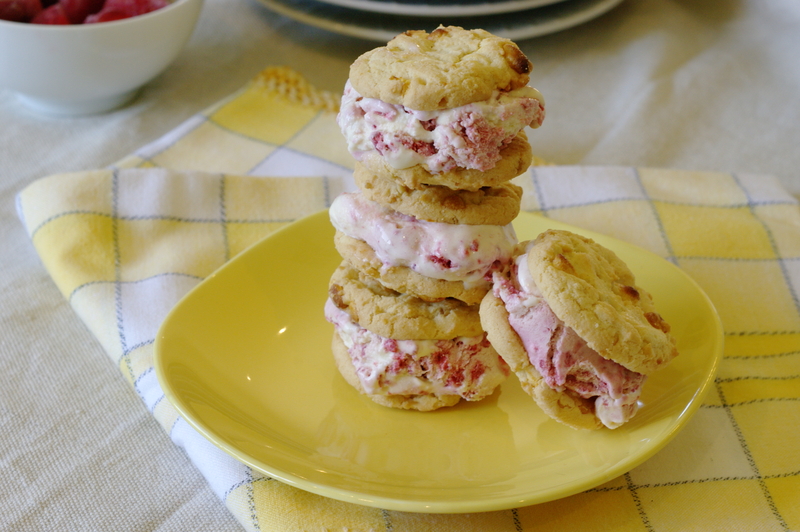 Remove berry ice cream mix from freezer and simply sandwich a scoop of ice-cream between two cookies and eat quickly! Btw, haven’t seen you around at Fiesta Friday. You’re not coming this week? They are a serious vice for me Ayesha. Endless possibilities and all of the delicious. Especially when topped with a squeeze of ice magic!